I tend to cook just enough for one meal, so figuring out how to turn leftovers into new meals is a rare challenge – and kind of a fun one. I didn’t do anything wildly creative or exotic, but every meal managed to feel different from the one before, which was the goal. That being said, I was happy to see the last of the turkey and Brussels sprouts go. 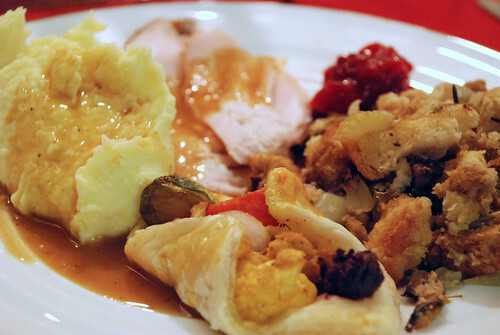 The shots below are an abridged photographic record of our Thanksgiving leftovers. (People were spared such displays before the Internet came along.) Hopefully they will inspire someone out there to repurpose the leftovers from their next holiday feast rather than trash them. 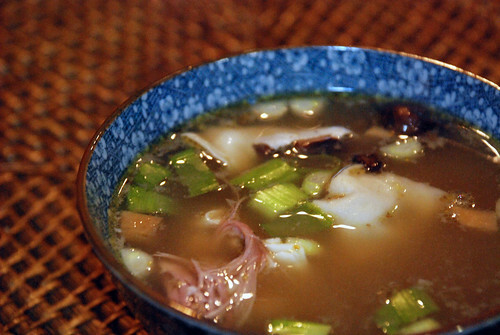 We stripped the meat off the turkey on the day after Thanksgiving, and made a broth, which ended up in a few soups. This turkey wonton soup was the best of them, and featured wontons stuffed with leftover veg and cauliflower purée. The wontons lacked a bit of structural integrity, but somehow it all worked. We used the meat in a few different ways. 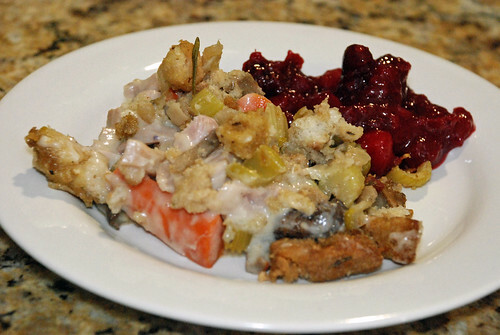 Some ended up in soups and sandwiches, and one thigh ended up in a baked turkey hash with a stuffing topping. We used up a lot of the veg in the hash as well, and flavored the white sauce with the last of the gravy. 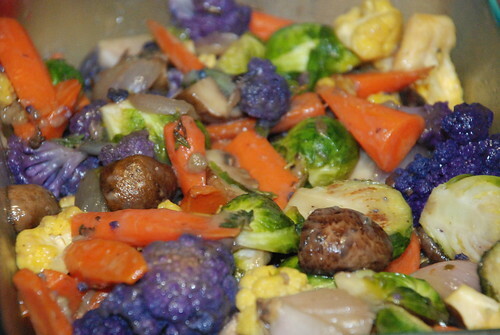 This vegetable medley had a lot of great flavours and colours, and found it’s way into just about every meal for for several days. In addition to the hash and the soup, it was used in omelets and a frittata – and made for a good side dish all on its own. We entered the holiday weekend with an embarrassment of Brussels sprouts, and had to get creative to get through them all, while still maintaining a little variety in our diet. Two dishes that stood out were some Brussels sprouts tacos and this dish made with Brussels sprouts, apple, shallot, garlic, apple cider vinegar, a bit of honey, salt and red pepper flakes. So what did you do with your leftovers? This entry was posted in On food waste, Waste less recipes and tagged Brussels sprouts, cranberry sauce, food waste, green living, hash, leftovers, stuffing, sustainability, sustainable living, Thanksgiving, turkey wonton soup, vegetables, want not, waste not..., wasted food by Jean-François. Bookmark the permalink. I love this visual of the many ways to use leftovers! I absolutely love having leftovers, because you can cook a new dish but most of the prep work is done for you! Thanks, Kate. Leftovers are rare at our place, because I usually cook just enough for one meal, but its a nice challenge to keep them interesting – and does save time in the kitchen. Thanks. 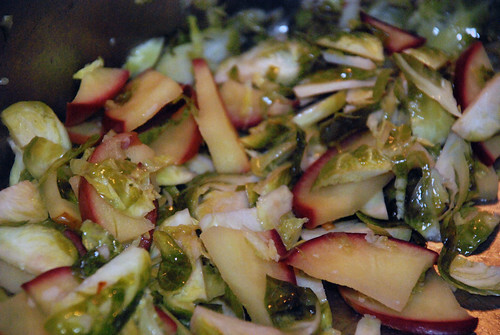 We had an apple and plenty of sprouts, and it seemed like a good combination … and it worked out really well. The other flavors really balanced the bitterness of the sprouts nicely. I also tried out Angie’s recipe that week – though got no pictures of that one. Well let me tell you: sprouts, lemon juice and pistacios go together splendidly.